It's been a really exciting week and I can't believe I haven't posted since Monday. You know how it is, but, we've been very busy spinning and dyeing away. 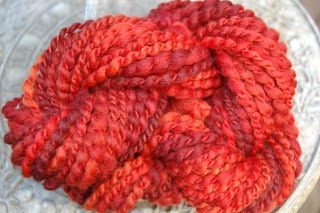 First I've spun the orange/overdyed red yarn and I absolutely love it. I know I've said this a million times before but I never get used to the feeling of looking at the unpromising newly dyed yarn, the doubt as to whether it will be nice or maybe a little off the wall. And then I start spinning and whatever magic happens and I love the yarn that appears. This is what I'm talking about!! The other VERY exciting thing this week is the launch of the book A Stitch in Time. I attended the launch party on Thursday night which was really lovely. The dress code was 1940's cocktail dress and everyone had made a fantastic effort. There was a fashion show with some of the knitted garments, there was a knitted dress which was just outstanding. The models were gorgeous and the less said about that the better. The highlight for Jinny and I of course was seeing our handspun in the book in a pale teal knitted cardigan. We were both very proud and hope that many people will be reaching for their knitting needles immediatley. The beauty of the book is that the patterns have been updated so that the garments are easily wearable today. And who doesn't want the glamour of the forties! 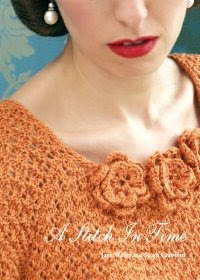 If you would like to order the book, take a look at www.knitonthenet.com to order. One last little note. We've been so pleased (as we've mentioned) about the D'arcy Spice Beret so we were gutted! when we realised we'd made an error in the pattern. We have found the offending item and are in the process of changing the pattern. We're really sorry and hope it hasn't spoilt anyone's knitting pleasure. The pattern will be amended at the beginning of next week.